Audits are a necessity in the modern business world. Businesses are often required to undergo audits from external agencies to ensure that processes meet testing and control requirements. This fact is particularly true for financial and information technology firms. In order to prepare for these external auditors, companies often conduct internal audits to identify potential risks and gaps. An internal audit checklist can help internal auditors and IT professionals move through the audit process as painlessly as possible. First, complete the Plan tab. This part of the internal audit checklist is where control areas, control details, testing information and any additional notes are recorded. It is the initial step for internal audits. Second, complete the Execution tab. Detailed testing information, frequency and notes on the testing results should be recorded on this tab of the internal audit checklist. 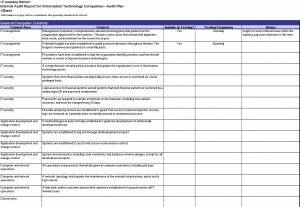 Lastly, complete the IT Audit recommendations tab of the internal audit checklist. Auditors will use the General Computer Controls and the Application-specific Controls tabs to identify recommended changes to existing controls based on the testing results. First, be as thorough as possible when completing the Plan tab of the internal audit checklist. All control areas should be identified and specific details regarding the control should be spelled out. Miscommunication at this phase can invalidate an audit. Auditors should not rush through this tab. Second, special attention should be paid to the Test of Controls fields of the checklist. Invalid information can lead to false positives during testing. Like the Plan tab, the Execution tab should be carefully reviewed for any vague or misleading instructions. Lastly, General Computer Controls and Application-specific controls should detail the job role responsible for adjusting the control. Recommendations are not effective if they are directed at the wrong personnel, and this can lead to future negative audit findings. Audits are unavoidable. Bad audits due to lack of organization are easily avoided. By using the Internal Audit Checklist, auditors and IT professionals can turn a daunting process into an effective one.